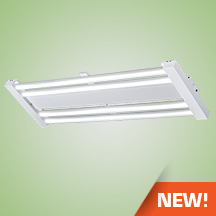 The high lumen output luminaire is designed to be a replacement for HID and fluorescent high bays. It is optimal for lighting applications where long life, low maintenance, and consistent color rendering is required. Areas with limited accessibility due to fixture location or where heavy pedestrian or vehicle traffic makes maintenance difficult are ideal applications. The high wattage/lumen output allows the fixture to be used for warehouse, manufacturing and big box retail applications. The robust housing is constructed of code-gauge (22 gauge) cold rolled steel. Rigid stiffening brackets prevent twisting and bowing. Engineered for exceptional thermal performance using lightweight aluminum thermal LED heat sinks. Open structure design allows for natural convective cooling. LED strips have a conformal coating to prevent damage caused by moisture and condensation. Optional End Caps and glare controlling LED Diffuser Lenses available. Wireguard attachment points provided. Conformally coated high output linear LED strips provide a medium light distribution pattern and exceptional horizontal and vertical performance. Glare controlling LED Diffuser Lenses available. Available with optional MIRO® 4 reflectors for a narrow/aisle beam spread. Class II long life LED’s and high efficiency drivers work together to provide superior performance in a safe and efficient package. 12 light levels provide a wide range of output options, 525mA Energy Saver 700mA long-life/high efficiency and 1400mA high ouput driver operation.. L95 at ? hours L70 ≥ ? hours. LED’s available in 4000K and 5000K with a CRI >80.Electronic drivers are available in 120~277V or 347~480V configurations. Power factor >0.9, 0-10V dimming standard (dimming leads pulled through upon request). Modular wiring drop cord may be factory installed (contact your sales representative for details). Suitable for suspension mounting via aircraft cables, jack chain with “S” hooks, end-mount tong hangers; monopoint mounting via a ½” rigid or swivel pendant system; or surface mounted directly to a standard junction box. Class II compliant. Complies with UL8750. ETL listed for damp locations. Meets US and Canadian safety standards. -40°C to 50°C ambient operation. RoHS Compliant.